Three days after returning from Peru, I flew to LA for a food tour. Well, no, I actually went there to do a college tour, but the amount of food I ate while I was there made it feel like I had come just for the food. I had a great time at the campus, visiting my family, and meeting my newborn cousin, but above all, eating food. Be prepared to hear the words: yum, good, very very good, and amazing, never great. You can also consider this a definitive list of places to eat in and around El Segundo. I was so excited to eat, I kind of forgot to photograph the food, so enjoy some pictures of me. Let’s start with Occidental College, where I enjoyed not only the on-campus marketplace, Green Bean, and Tiger Cooler, but also the off-campus taco trucks. I had Charlie’s Tacos for dinner, and the potato taco was a taste like no other. Spicy, sweet, and addicting. The Green Bean served a yummy soy latte, and their kombucha on tap was what convinced me to commit (oxy ’23!). Oh, and the sushi burritos in the Tiger Cooler? That’s something I will be eating daily. Okay, on to the flavors of El Segundo. First we have the Blue Butterfly, the main street cafe that serves a mean tea latte. The lavender matcha latte is good, but have you tried the blue butterfly latte? If the blue color wasn’t enough to convince you, let me say this, it’s naturally colored from the tea used, a floral Asian tea, and contains rose syrup. I had it with almond milk, and I wished I lived in El Segundo because it’s something I want everyday. The Mariposa Street bagel is also something to awe over. Sausal is also a main street Gundo restaurant, that i tried not once, but twice in my week stay. The guacamole appetizer is good, but the sweet corn elote is to die for, seriously. The first time I had the fish tacos, which didn’t disappoint, and the second time I enjoyed the grilled shrimp salad, which was equally amazing. Another Mexican-fare favorite in El Segundo is Beach Mex, just off main. I ate my weight in their guacamole, and was too full to finish my sweet and spicy shrimp tacos, although they were very very good. If you’re looking for a dessert in Gundo, may I recommend Smoky Hollow Baking? Difficult to find, but definitely not to eat. We picked up a few of the marshmallow, chocolate, peanut butter bars, and I have been craving them since I ate them in 0.2 second. Also in El Segundo we have Brewport, where we went for brunch on Sunday. While it’s not as fun if you’re not 21+, the food is pretty darn good. DO: get the lump crab hush puppies, do it. DON’T: there are none, just get the crab! I also enjoyed the crab cake Benedict, and recommend it. Okay one last place in El Segundo, Petro’s Kafe. We had it on my last night, and I was so full from eating that I almost didn’t want to eat. But I did. I got the Watermelon Salad, which consisted of watermelon, tomatoes, and feta. It was the perfect amount of food for me. Let’s move on to Manhatten Beach food. Here we have the Beach Cafe, located on, you guessed it, the beach. The food was good, the view was better. I got the quesadilla, which was yummy, and a strawberry-mango smoothie that didn’t help me deal with the cool breeze. We also have Strand House, an upscale place that serves beach views while not being on the beach. I got the tuna melt, which was a yummy sandwich. There’s also Brewco near Manhatten Beach, where I had my first vegan burger at a restaurant. 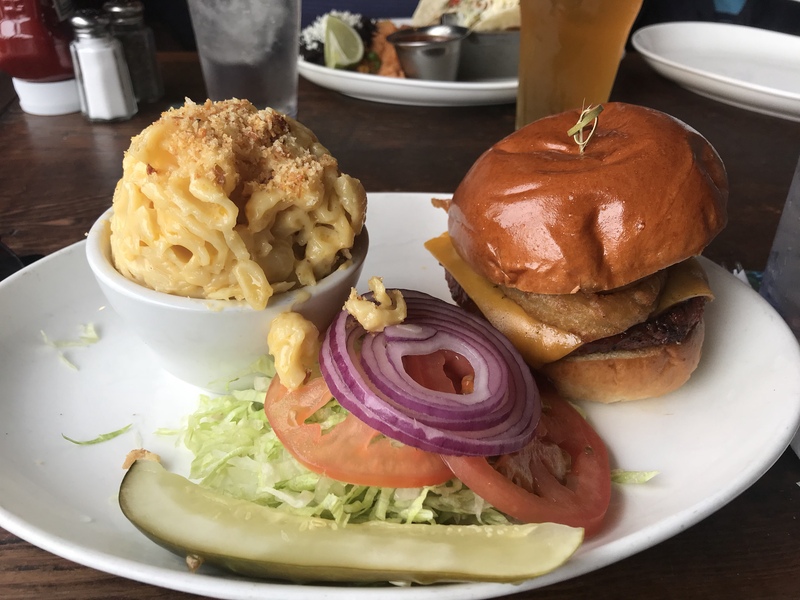 They serve Beyond Burgers as a substitute, so I was able to enjoy their BBQ burger with my vegan twist. Two Guns is a popular coffee chain in the area, so we had to check it out. Their soy latte was pretty yum, but their lack of wifi was pretty sad. One night for dessert we drove to Handel’s, an amazing ice cream place. The line was long, but luckily I have the best grandpa that will wait in it for me. I tried the strawberry, pistachio, cake batter, and buckeye flavors, and none of them disappointed me. On the contrary, I disappointed myself when I realized there was no way I could finish all of it. Okay, last place I swear. Best for last, they say. Well, my favorite of the week was Tin Roof Bistro, where we enjoyed dinner one night. I had the scallops with risotto, and it was absolutely delectable. I have not forgotten about it, and I even tried to recreate it a few nights ago with regrettable results. Oh and don’t forget about dessert. Their chocolate mousse was a sublime way to end the night. I hope you liked reading this list half as much as I enjoyed eating all the food on it. If you’re not hungry now, then I’ve failed. Enjoy eating your way through LA! Previous South America 2018 Video is Here! Next How to Fill 36 Hours in Amsterdam!